This weekend, I have the awesome pleasure of seeing a concert version of Company at Lincoln Center. This would be exciting enough. What makes it thrilling is the star-studded cast, including Neil Patrick Harris as Robert, Stephen Colbert as Harry, Patti LuPone as Joanne, Katie Finneran as Amy* and Christina Hendricks as April. *Confession: I didn’t know which role Katie Finneran was playing until about five seconds ago, and a little thrill went through me when I pictured her singing “Not Getting Married”. So, I know the whole thing on Broadway right now is stunt casting to sell tickets. Sometimes this works (see: Kelsey Grammer in La Cage Aux Folles); sometimes it doesn’t (see: The entire cast of 2009’s Bye Bye Birdie revival with the possible exception of John Stamos, who can at least carry a tune, GINA GERSHON.) But I have a good feeling about Company. First of all, it’s a scaled down concert version, second it’s only for a couple of days, and third everyone associated with the project can actually sing. B: I’ve been a fan of Katie Finneran’s since she played the uptight sister of Jayne in the short-lived series Wonderfalls, but I think the theater loves her even more. She’s a two-time Tony winner, her most recent win last year for Promises Promises. I didn’t get to see it, but everything I read said she stole the show. She was lovably neurotic in Wonderfalls; this can only be a good thing for playing Amy. In my head, Christina Hendricks can actually play the accordion. And also, I miss Mad Men, and really don’t want to wait a freaking YEAR for new episodes. Sigh. But that’s for a different post. D: Stephen Colbert! Stephen Colbert! 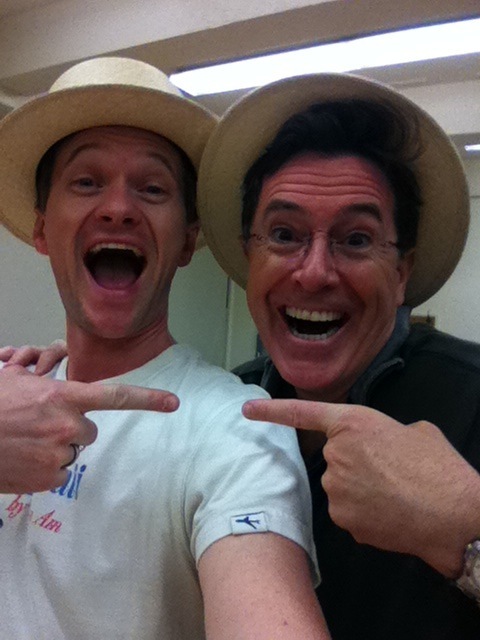 I am most excited about seeing NPH, but Stephen Colbert is just more icing on the cake. And for some reason, I am itching to see him sing “Sorry Grateful.” Like Christina Hendricks, his voice seems so well-suited for this song. Hopefully this will not be interrupted by people taking their seats and loud children, like it was in my stress dream a few weeks ago. (Yes, I had a stress dream about Company. I dunno, guys. Ask my subconscious.) Anyway, if you watch The Colbert Report, you should know that Stephen has a pretty good set of pipes. I cannot freaking wait to hear them live. This isn’t able to embed, but click here to see Stephen sing. E: Patti LuPone. To be honest, I am nervous to see Ms. LuPone live, because she kinda scares me a little. Okay, a lot. Woman is a diva. Woman has ever RIGHT to be a diva, but still. I just don’t want her yelling at me. Or anyone else. So everyone seeing the 8 p.m. show this Saturday, respect the LuPone, ok? This is from the Sondheim birthday concert last year, and I love this because you can just tell she has been waiting YEARS to sing this song. And sing it she does. And sing it she will on Saturday. No, she’s not Elaine Stritch, but who the hell is? No one will ever sing it like her, and Patti does a pretty good second. Also, I respect that she puts her own spin on it, and doesn’t try to be Stritch. F: NPH has some big shoes to fill with “Being Alive”. Raul Esparza blew the lid off of it in the 2007 revival. And as much as I love NPH, I am not expecting this to be the powerhouse Raul made it. However, it’s still one of the best songs Sondheim ever wrote, and maybe even one of the best songs ever written. Excuse me, the room just got a little dusty, I need to wipe my eyes. This weekend can’t come soon enough, y’all. It’s been busy ’round these parts lately. Everyone I know had a baby. Well, okay, only two people, but two of the closest people in my life. Hence the lack of blogging. That doesn’t mean I have been ignoring my pop culture duties. That would never happen. So here are some things I’ve been digging lately. A few years back, I tuned into a new show called Mad Men, lauded by critics and TV watchers alike. Watched it for about 10 minutes, realized I wasn’t paying attention, turned it off, and didn’t watch another episode until this month. Guys, I don’t know what I was thinking. This show…is SO GOOD. Over the weekend, a friend asked me how it was, and my response was one simple word: “Delectable.” That it is, and not just for Jon Hamm. (Though, lets face it…) Everything, from the cinematography, the clothes, the writing, the acting, the music (THE MUSIC, YOU GUYS. SO PERFECT)…it’s all amazing, and all a feast for the senses. It’s so good that, instead of doing my usual marathon watch, I am limiting myself to one or two at a time. (And trust me, for me, that IS limiting.) So far, I am about 2/3 of the way through season 2, and there hasn’t been one sub-par episode. Also, a word on January Jones: I have not seen her now famous SNL hosting disaster last year. Don’t want to. But in terms of dramatic acting chops? Gal has it. She has Betty Draper DOWN. Do I like her character? Not really, but damn if she doesn’t do a fine job portraying the unhappy housewife. 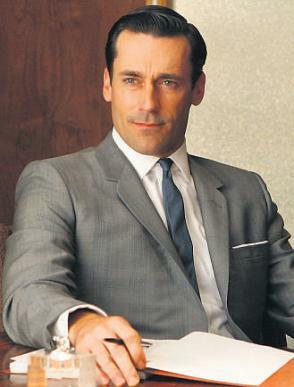 Also, Jon Hamm is really, really hot. Unlike a lot of hot actors today, he actually has the chops to back it up. Resonates on so many levels, y’all. Also, it’s no secret I am a sucker for nostalgia. So yeah, umm, watch Mad Men. 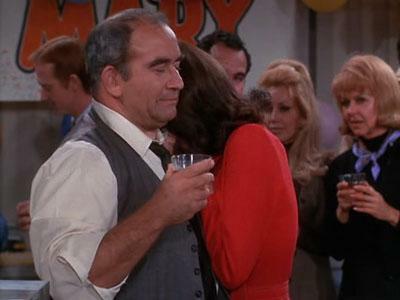 Not since Gilmore Girls has a show transported me so fully into another world. * Wednesday night comedies are back! Yay for Modern Family and Cougar Town. * A few years back, I read what remains to be my favorite book ever, I Know This Much is True by Wally Lamb. I recently read his follow-up book, The Hour I First Believed. While it takes place in the same town, and features some of the same characters, it really doesn’t hold a candle to I Know This Much… It’s still good, but Mr. Lamb gets a bit too caught up in his own drama for me. Kind of disappointing, because She’s Come Undone and I Know This Much Is True are both masterpieces. * Is anyone going to the Stewart/Colbert rallies? I kind of really want to. Is it just me? But seriously, guys, go watch Mad Men. That’s really the point of this post.